The Mansion House (Irish: Teach an Ard-Mhéara) on Dawson Street, Dublin, has been the official residence of the Lord Mayor of Dublin since 1715, and was also the meeting place of the Dáil Éireann from 1919 until 1922. The Mansion House was built in 1710 by the merchant and property developer Joshua Dawson, after whom Dawson Street is named. Dublin Corporation purchased the house in 1715 for assignment as the official residence of the Lord Mayor. It retains this purpose to this day. In 1821, the Round Room was built in order to receive King George IV., while the distinctive metal portico over the main door was erected for the visit of Queen Victoria in 1900. The First Dáil assembled in the Round Room on 21 January 1919 to proclaim the Irish Declaration of Independence. Two years later, in 1921, the Anglo-Irish Treaty was ratified in the same location. 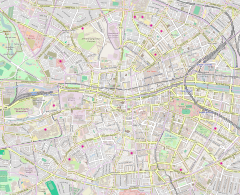 In the 1930s and 1940s, plans were made to demolish the building, and all other buildings on the block on which it is located (which covered an area on Dawson Street, Molesworth Street, Kildare Street and the North side of St. Stephen's Green), to enable the building of a new Dublin City Hall. However the decision of the Government to erect a new Department of Industry and Commerce on a site on the same block, on Kildare Street, led to the abandonment of the plans. On 21 January 1969 a special fiftieth anniversary joint session of Dáil Éireann and Seanad Éireann assembled in the Round Room and was addressed by the then President of Ireland, Éamon de Valera. In August 2006, the loyalist paramilitary Ulster Volunteer Force claimed they had planted a bomb in the Mansion House in 1981, in an attempt to wipe out the Sinn Féin leadership at their party conference of that year. The claim led to a security alert at the house, as the Garda Siochana and army searched for the 25-year-old bomb. ^ a b "Venue History". Conference & Events Venue and the Mansion House. Retrieved 15 November 2018. ^ Rowan, Brian (31 August 2006). "UVF Sinn Fein massacre plot". The Belfast Telegraph. ^ "Search at Mansion House is completed". RTÉ News. 31 August 2006. This page is based on the Wikipedia article Mansion House, Dublin; it is used under the Creative Commons Attribution-ShareAlike 3.0 Unported License (CC-BY-SA). You may redistribute it, verbatim or modified, providing that you comply with the terms of the CC-BY-SA.